Yesterday, I made some wraps. As a result, I think wraps are kind of annoying. This recipe was "White Bean and Roasted Red Pepper Vegetable Wraps with Spinach" from Supermarket Vegan. There's a nice adaptation to this recipe over at Resolute Woot if you want to see what the recipe is like. First, I should say, though this cookbook is called Supermarket Vegan, I don't actually do a lot of the Supermarket bits of it like using canned beans, etc. So, I pressure cooked some white beans (Great Northern because I was out of Cannellini) and seasoned them with bay leaves, pepper, herbs and garlic. Then when those were cooled, I made the spread, which was good, but even after adding extra garlic, was still a little bland. When I got to the wrap part, I found that the Ezekiel 4:9 tortillas had already molded all over the place. I guess this is one of the things you realize when you start buying processed foods that are a little less processed than your usual processed foods. They're not as bathed in preservatives to keep them on the shelf for months. I should have just made the tortillas myself. At any rate, I had some roti dough in the fridge, so I just toasted those up in a pan and assembled the wraps. Jacob doesn't like spinach so I made his with cabbage and I made mine with a mix of cabbage and spinach. I also added shredded carrots. In hindsight I should have added green onions, too. That would have been nice. The roti were sort of small, so getting them to have enough filling without spilling all over the place was a pain. I think that next time I will just skip the "assemble and refrigerate for at least half an hour" step and refrigerate the wrap contents and then let everyone assemble their own wraps at the table more like cold burritos. 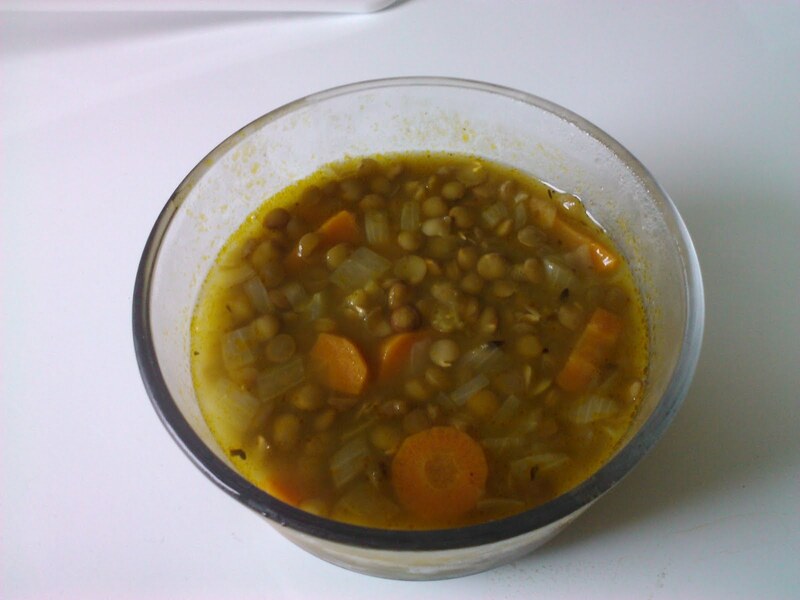 I also made the "Easy Lentil Soup" to go with it which was, indeed, easy. It was pretty good. Floof in my Food has an adaptation of the recipe for that one. Jacob is a huge lentil soup fan and he liked this one better than the last version, so I guess I can toss that one out. I added about twice as many carrots and onions as were called for, as is my way. I like everything to have lots of veggies. Boyfriend added Sri Racha to everything as usual. I sometimes find it hard not to be insulted by this, but, it is his way. He likes everything to be spicy. This morning, I made some smoothies since I bought a metric ton of strawberries this weekend and they are ripening fast. They're so good and juicy I want to spread out a blanket on the grass with a book and some sun and just eat them all day long. But there's school, so I will stay inside and drink my smoothie and do statistics instead. My smoothie this morning was 1/2 cup frozen berry mix (blueberry, raspberry, blackberry), a handful of strawberries, half a banana, 2 tablespoons of almond butter, 3/4 cup of unsweetened soy milk and a cup of spinach. I don't usually add spinach or greens to my smoothies but my boyfriend's sister is crazy about it, so I thought I would give it a try and start with a cup. I haven't been very happy with my blender's performance lately and it is on loan to a friend right now who doesn't have one and is just getting into cooking and stuff. Actually, I think I just gave it to him, and if I didn't and you're reading this right now, please, just keep the blender and pass it on when you get a nice one. It's good for small, light jobs but it's not up for making smoothies every day, so I just use my food processor which absolutely murders some frozen fruit. It's so fast it basically makes ice cream of it if all I use is frozen fruit and some milk or yogurt. Anyway, it did a great job this morning, but I should have mixed up the spinach first all pesto style, because I did have some leafy bits floating around. Next time. I couldn't taste the spinach at all, though, which was cool. I felt like I was sneaking myself vegetables. Not that I have to do that, but I definitely don't eat as many greens as I should. Jacob's smoothie, on the other hand, was a different story. 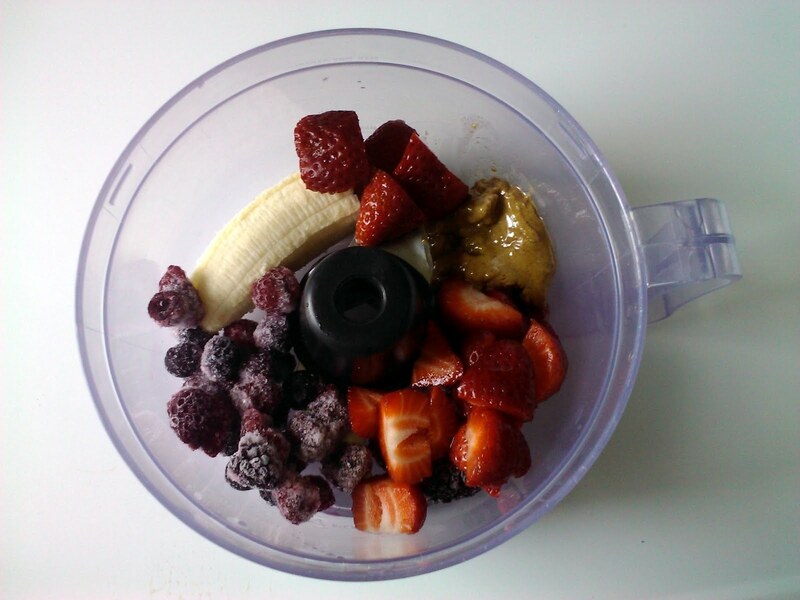 He doesn't like the seeds of the berry mix and he likes his fruit a bit more tropical. And he knew there was spinach in mine. One drink and he was like, "Something isn't right about this." Then he stuck his tongue out and there was a little leaf bit on it, so there wasn't going to be any tricking him this morning. 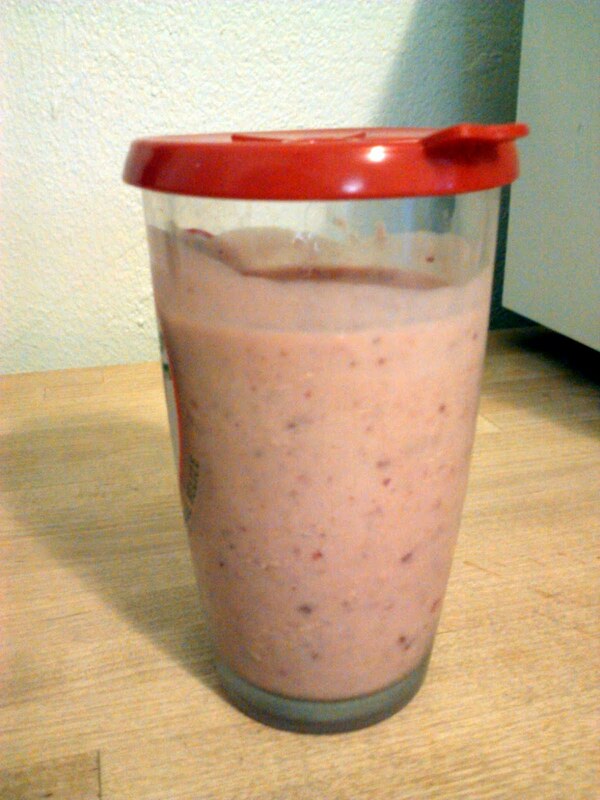 I made his with a handful of strawberries, frozen tropical fruit (pineapple, mango, papaya), half a banana, 2 tablespoons of peanut butter and a cup of unsweetened soy milk. He had enough for a big glass and a snack glass for after he works out. Boyfriend's treat this morning was some cold-brewed coffee. I've been wanting to try it after having some that his cousin made that was so good. I looked around at various recipes and then just kind of winged it. I have a French press and a Hario carafe (see below) that we use for making pour-over coffee, so I figure even when one is full of grounds waiting to go to the garden I can use the other to make the next couple day's coffee. Plus, I don't need to buy any extra equipment. At about 6:00 p.m. last night, I coarsely ground about 6 scoops of coffee and then filled the rest of the carafe with water, gave it a good stir, put the lid on it and let it sit till 8:00 a.m. Filtered it into a mason jar so I could store the excess in the fridge. Into his travel cup, I added 6 ice cubes, a spoon of sugar, some soy creamer and about a cup of the coffee and gave it a shake. It looks like I can get two days of coffee out of one batch. He said it was the jam and that it tasted like a frappuccino. He likes his coffee really strong, so I used more coffee grounds than the recipes I found called for. America's Test Kitchen says go for a 4:1 ratio of water to coffee by weight or 1:1 by volume. The New York Times recipe says 1/3 cup grounds to 1 1/2 cups water. I just used 3 Hario scoops (which is apparently 36 grams) per cup since that's what I use when I make him a strong cup of hot coffee in the morning. I'm going to experiment with making ice cubes out of coffee for the next batch. I may also try a 24-hour steeping time just to see how that works out. Am I crazy to be so happy about this coffee thing? I am so happy about it. I mean, I figure it will save me time in the morning. I can even fix it at night and he can just grab it out of the fridge and I won't feel bad if I stay up late studying and want to sleep in a little instead of getting up to make coffee. Also, it will be that much less energy to heat up a kettle every day and that much less heat set loose in my house. I know it's not much heat, but if it's going to be 110 degrees every day this summer like it was last summer, every little bit counts. Plus, he runs hot anyway and I'm sure the last thing he wants in the summer is a hot cup of coffee when it's already 90+ degrees as he's walking out of the house. This weekend marks the first time in about seven months that I've seen strawberries that made my mouth water. I know they're from California, but I couldn't resist. We need to eat more fruit in this house! 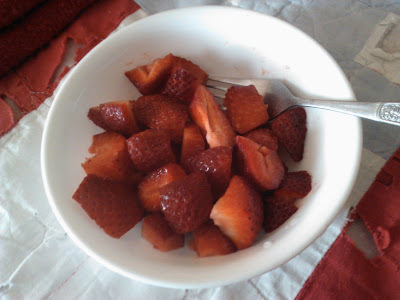 This morning I sent boyfriend to work with whole wheat pancakes leftover from the weekend plus a bunch of strawberries. I had been making this pancake recipe with just unbleached flour but since I'm trying to get away from most of the overly processed stuff bit by bit, I subbed all of the flour with whole wheat pastry flour. I figure that's a start. I actually like the recipe better that way. Nutty and flavorful instead of bland. I upped the baking powder a little bit to make sure they got fluffy but really, I think they key to that is just letting the batter rest. I wait 10 minutes and the batter gets nice and airy and it stays that way while they cook. Whisk together all the dry ingredients, then add the wet stuff and whisk gently just until the flour is mixed in. Don't overmix - it's OK if it's a little lumpy. Let the batter rest for 10 minutes. About 6-7 minutes in, heat your griddle or pan. When pancakes are just dry around the edges and bubbles are starting to form, flip and cook about a minute more. After I've poured the batter, if I have some fruit around, I will usually toss some onto the wet side at that point (peaches, mangoes, blueberries and other berries, etc.) and they cook up nicely once you flip over. A minute or so is just enough to burst the berries. 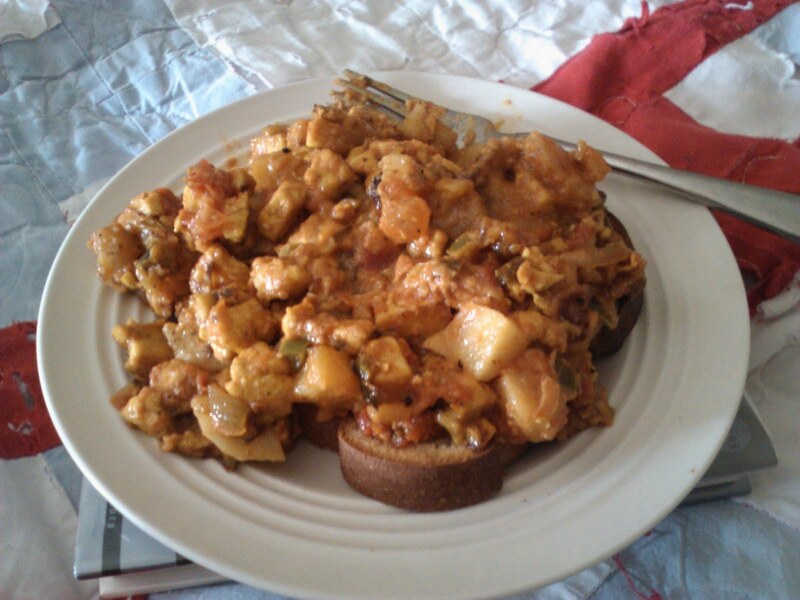 This morning's meal: leftover tofu scramble + potatoes. So, last night my smoochy muffin went to Whole Foods and bought lots of yum. I didn't know what time he was going to get back so I made a tofu scramble. This is becoming my go-to meal on lazy nights. It sees plenty of time in the weekend brunch rotation. It's kind of becoming my new comfort food. In another life, that role was played by a pint of Ben and Jerry's, fried chicken, nachos, a giant piece of roast beef or a BLT with about a bajillion slices of the B. Until about six months ago, when I would get frazzled, my mind would still go to those things briefly before I shut it down. 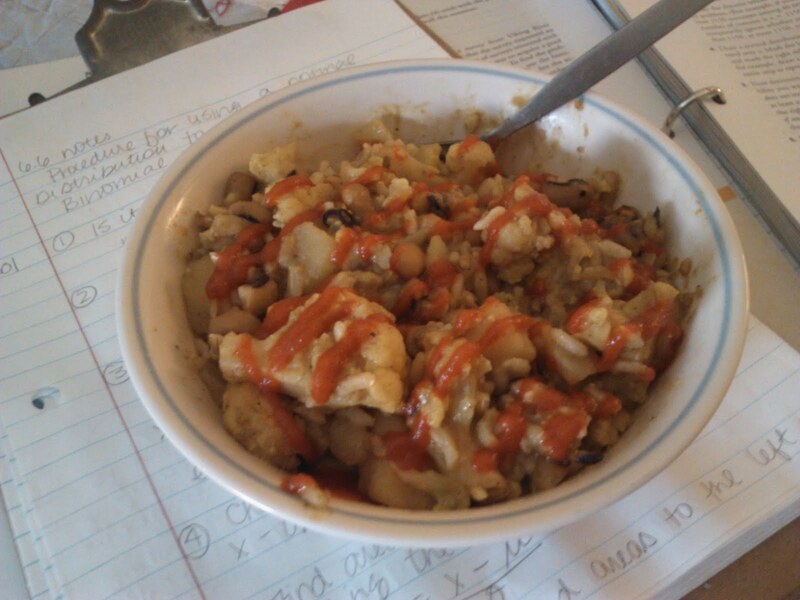 Now, though, I'm happy to say that tofu scramble is what pops into my head when all has gone awry. Anyway... These leftovers were going to be for the man of the house, but he remembered this morning that they're doing some sort of lunch thing at work, so the leftovers became mine. Except that he'd already put cheese on it, so then I figured I'd give it to my son, but he'd already put salsa on it, too, and Jacob's been having heartburn problems so is avoiding tomato things. I figured it's easier to pick the cheese off than to try to get the salsa off, so I did that. This is where I got to that point where I like to talk myself into something. You know, the cow's already been milked, the cheese has already been purchased, the demand has already been made, so why don't you just eat it? It's just an ounce or two of cheese. What's it going to hurt? But screw that. I did not just walk 2 miles to work off some damn cheese. I walked it to work off some other past cheese transgression, not some future one. Picking my battles. Cheese loses today. Cook the veggies in 1 tablespoon of the oil until just tender. It takes the tofu a while to cook, so they'll burn if you let them go too far. Add the rest of the oil and then after it heats up, add the tofu, squeezing the chunks through your fingers a little. Not too much since you can break it up in the skillet while you're cooking. Over medium heat, let the tofu just sit and brown on one side, then start stirring it up so the other parts brown. When it's to your liking (some like it crunchier, others not so much) add all the spices and nutritional yeast and mix well. Cook one more minute and serve. Good with toast, tortillas, potatoes, throw salsa on top, squeeze a lime over it and serve with avocados, side of vegan sausage and / or vegan cheese... it's pretty versatile. The omnis at my house love this, but they didn't love it as much before I started using the black salt. That really does make a huge difference. Also, I was using extra firm tofu and accidentally used medium firm one day and I prefer the texture I get with that. Since my son is allergic to eggs, he is always excited to hear I'm making a scramble. It's been a while since I've written. I kind of fell off the wagon and have been sulking over here and making my way back. It all started with Thanksgiving. I got a vegan meal ordered from Whole Foods and bought snacks and such to eat because we were away from home. Aside from some pizza one night that had cheese, I wasn't doing a bad job at all. Ordered a Greek salad out without feta and otherwise found things to eat that were acceptable. Then, Christmas came and since we were going to be out of town for nearly 3 weeks, I decided to loosen up my "rules" a bit in order not to go completely insane and have to explain myself at every turn. Call it laziness, call it what you will. In a way it was sort of an experiment with my body, too. As if I wanted to prove to myself that YES, it really is the cheese making your cholesterol go through the roof and making you such a chunkamonk. So, I didn't go back to drinking cow's milk. I didn't butter my bread with actual butter. For the second year in a row, I didn't eat the traditional tortellini and opted instead for just a salad (it did have Parmesan in the dressing) and a couple of rolls. But I did eat cheese. And I had a couple of eggs. If it was mixed into something, I just didn't fuss over it. If it was easy enough to order without it, I did order without it or if there was something on the menu that was vegan (not often where we were) then I ordered that. A couple of times, I just threw my hands in the air as if I was giving up and giving in and ... (sigh). When I got home, I kind of just didn't stop eating cheese. What the hell? I mean, again, if the vegan option was there and easy, I did it. But if it wasn't... I'd just eat the vegetarian thing. And in the last few months, I have been feeling it. I have been feeling every bit of this cheese. And 10 pounds of it have settled all over my body but especially around my belly. That's probably compounded by the stress of two 18-hour semesters bearing down on me plus quitting my job so less income also making me feel anxious. And the guilt of every bite... the guilt. I don't even want to imagine what my cholesterol could be. Yikes. We just went out of town for spring break, and I vowed that when we got back home, not only would I be having a fresh vegan start -- clean slate -- but we would be moving even more toward using less processed food. There has been this sort of enjoyment that I've had with cheese for the past few months because I have always loved the taste and feel of it so much, but with it has come bad things for me. My taste buds want it, but my body just rejects it. My brain tries to justify it and then my body punishes me for it. Same thing with all the processed foods. Sometimes, these last two semesters, I have had so much reading and writing and research to do that I would go the whole day without eating a thing and not even realize it. Then I would be ravenous when my better half walked through the door, so we'd eat whatever was easy for him to cook and that meant a lot less vegetables (even with the winter CSA) than we'd normally have if I was cooking everything from scratch. I've learned from this for sure. I've learned that being newly vegan means you're going to screw up sometimes and that perfection doesn't come overnight or even after a whole year. But I've also learned that just because you drop the ball, it doesn't mean you can't pick it up again. I've learned that I can just never go back to cheese again. My body really doesn't want it. It's only the *me* inside the body that wants it. And that *me* gets very hangry and weak, but should not be listened to when she starts arguing for "just taking a bit of a vacation from it" or trying to justify every little thing. Tell that girl to shut it and power through. Get a banana and some almonds and then make some sensible decisions. Remember those times in your childhood when you really were hungry. I've learned that it's better to just go to a grocery store than a restaurant most of the time. I look at menus and I have noticed over the past couple of years that there are a lot more vegetarian options and that's definitely a step in the right direction. That's something I would have loved back in the day when there was never ANYTHING to eat out except a salad and usually even then you still had to ask for the meat to be left off. But, still, there's just so much on the menu (even veg options) that doesn't look appealing to me at all. And I'm tired of the only vegan option on the menu being something I eat at home all the time. I mean, I love hummus, but really? That's all you could come up with? And then even the vegetarian options are just yo dawg I heard you liked eating cheese so I put cheese in your cheese so you can eat cheese while you eat cheese. I've also learned that some of the changes that I made when going vegan are probably already permanent. 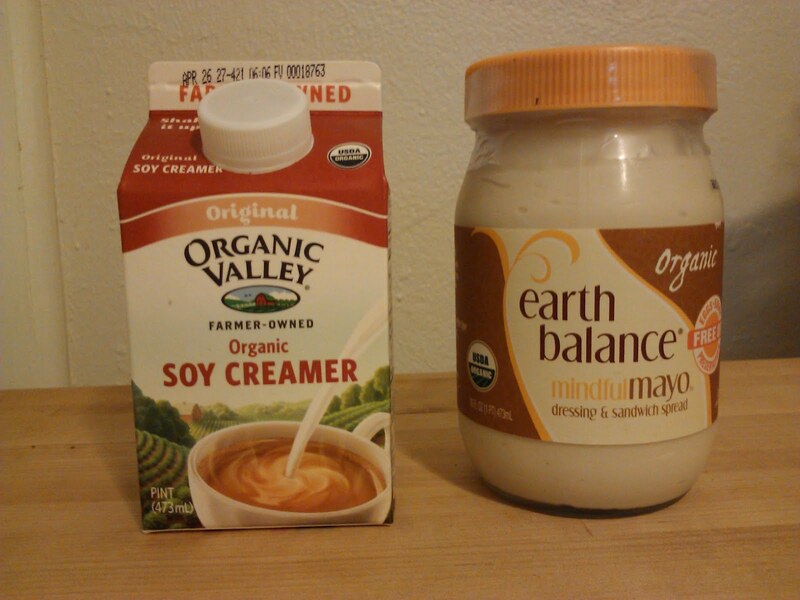 Though it was available to me every morning, I did not use half and half in my coffee. Surrounded by gallons and gallons of milk, I still did not drink a drop and took soy milk and almond milk with me wherever we stayed. I don't care about butter at all any more (and I'm really close to not even caring about Earth Balance, especially when avocados are around). While I did have a couple of eggs over Christmas, I find that I still don't want to bake with them and actually prefer making tofu scrambles a million times more. Fresh start. Better than no start.